Heather and Myles Geyman’s hand-slipcast speaker amps your phone's music while elevating its look. 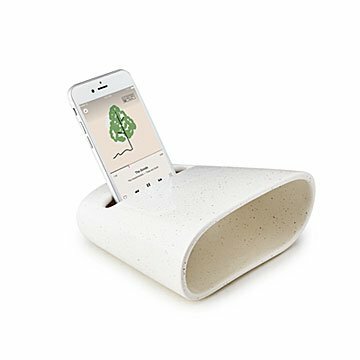 Add cool-looking acoustics to your streaming sound with Heather and Myles Geyman's handmade ceramic phone amplifier. An elegant blend of classic material, modern form, and impeccable craftsmanship, its shape is artfully designed to give your phone's audio a richer, warmer, more full-bodied sound. Glazed in a creamy, speckled white, it's a beautiful attention magnet in your office or kitchen. Because it doesn't need electricity, cords don't detract from its sleek, sculptural form. Just set your phone in the slot and enjoy with ears and eyes. Hand slipcast of earthenware ceramic in Pittsburgh, Pennsylvania. Myles and Heather Geyman story is better than a rom-com’s: They each rented space at a community ceramics studio in Pittsburgh and soon began collaborating, launched a business, and fell in love. Passionate about designing objects as functional as they are beautiful, the artists are drawn to many of the same things. “Inspiration often comes from the result of interacting with an object,” says Myles; other times, from the natural world. On a recent hike the couple was "inspired by the brilliant coloring and eroded forms of various rock formations.” No matter how their pieces become finished, for-sale items, Myles and Heather appreciate their luck. "Art has always been an integral part of our lives," says Myles. "We feel fortunate to be able to work together in a creative field every day." I love that this is a simple, attractive and non-electronic way to amplify music. Amplifies music enough to hear while in the shower. I feel like it's not adding clutter to my bathroom countertop since it's minimal and attractive. My partner loves it and uses it daily! I sometimes use it just as a phone stand.